Ruby's world has changed more than she ever could have imagined. She's in love with a powerful Frost King. She's the heir to the Fire Throne. And she may be a Nightblood—the spawn of a vengeful deity hellbent on releasing his wraithlike Minax from their prison. Once freed, these beasts will roam the earth, devouring every last person until he or she is nothing but an empty husk. But Ruby is able to control the Minax to a degree, and now she, her beloved Arcus, and her friend Kai must find a way to bring Frostbloods and Firebloods--sworn enemies—together to make a stand against a foe more deadly than any they've faced. Isn't the cover gorgeous?! And look how well all of the covers go together! I'm so excited to read this one, and I can't believe we have to wait almost an entire year! What do you think of the cover? Have you read Frostblood yet? What about Fireblood? Let me know! Right? And oh my god, Melissa, you need to read Frostblood, I know you'll love it! It's. So. AWWWWWWESOME!! This is one of those series that I adore the covers in both US & UK formats! (the times that they differ so completely!) Thanks for sharing!! Right? I loved it upon sight and it was killing me to have to wait to share it! I'm so glad you like it! That cover is really awesome! 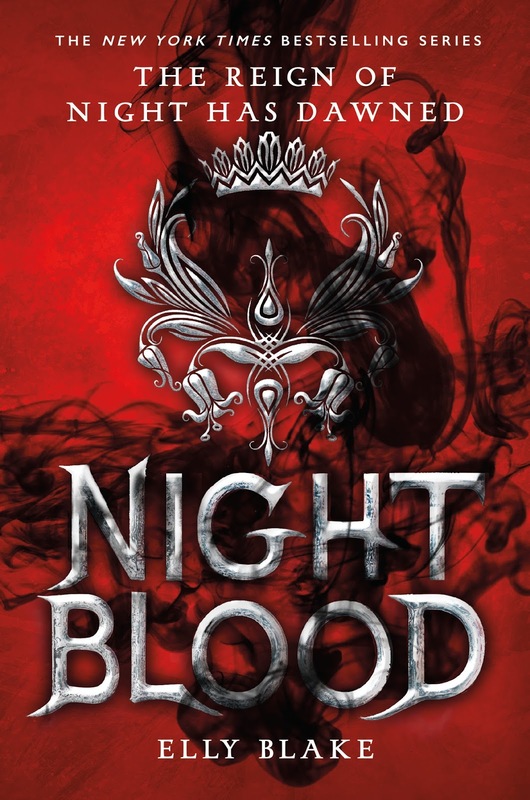 :D I think out of all three I love the one for Nightblood the most. I think so, too! And I hope so! My fave is still Frostblood but I love Fireblood too. 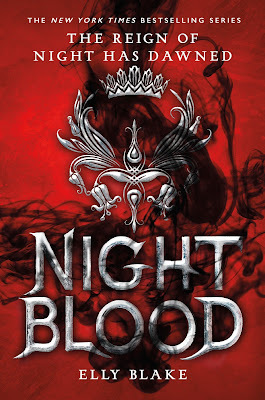 I can't wait to read Nightblood! Right?! And this trilogy has amazing covers and they all go together so well. I haven't read any of these yet but those covers are all gorgeous!!! Oh but you need to! 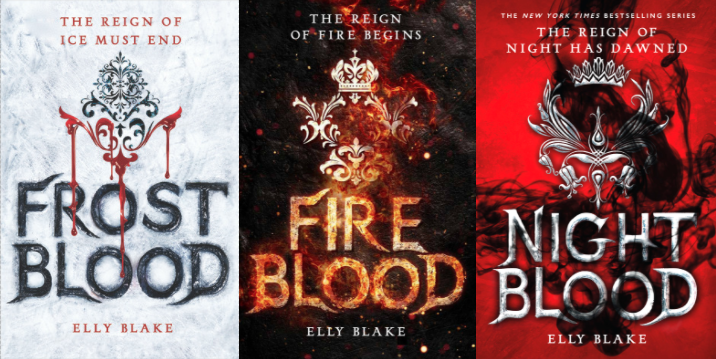 Frostblood is already out, and Fireblood will be out soon so make sure you get on it! SO PRETTY!! All the love to covers that match!! Right?! It always bothers me when the covers don't match and the covers tell the story of the series, so it's just wonderful! Yes, yes, YES! You need to read all of these books Becky! 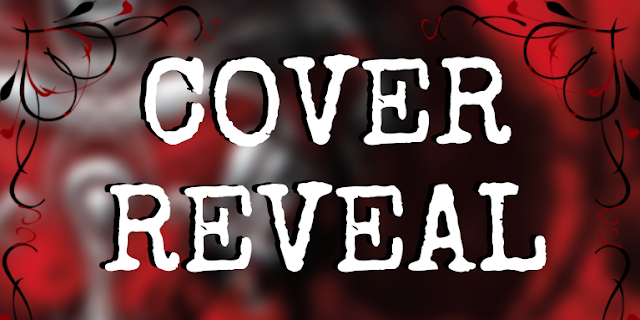 I can't wait to see what you think of Fireblood! Yes, Elly is amazing and the covers are gorgeous! Oh I like! Nice covers all 3! I havent read the series, but they look amazing! Definitely put them on your TBR! Frostblood is out now so you can start it! OOOH I LOVE IT! I haven't read the other books yet because I am a huge slacker with a way too big TBR, but this is definitely my favorite cover of the series! And since the third cover is out, I should probably get started on it, eh? Me too! And I feel you on the TBR problem, I feel like I'm so behind on a lot of the big books. And you should definitely get started on these books, Shannon! Thank you! I'm sure I'll love it since I adore the other two. You really need to try Frostblood, I highly recommend it! The covers for this series are all so beautiful! I have really got to start it one of these days. Thanks for sharing! This cover is beautifully wicked. *. * I can't believe I haven't read the first book yet. Wow, amazing cover! I still need to read Fireblood. I might wait a few more months just so that it doesn't seem like such a long wait until June, haha.